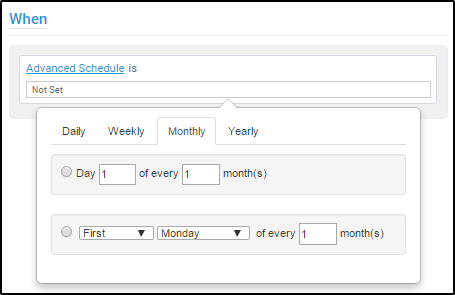 With this business rule you can set up a schedule and update the details of specified cards automatically. For example, you can configure the system to scan your cards every day and change the color to red for those cards which are assigned to a given user. These rules are executed once per hour. 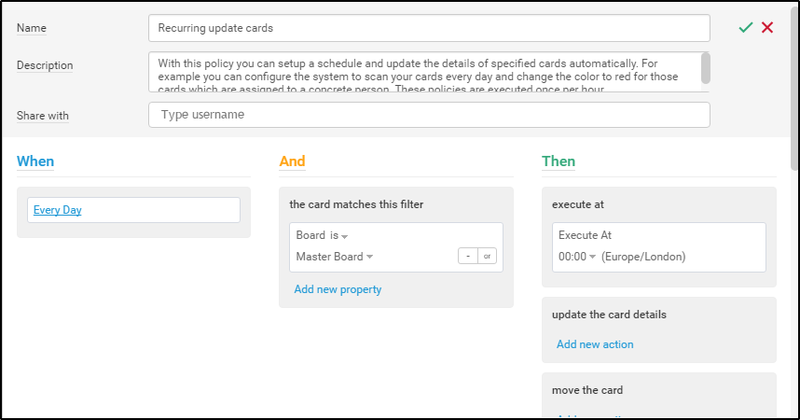 Go to your Administration panel at the top right of your screen ->open the Business Rules tab -> select the Recurring update cards rule tab. You can share the rule with other users (e.g. Workspace Managers), if appropriate. 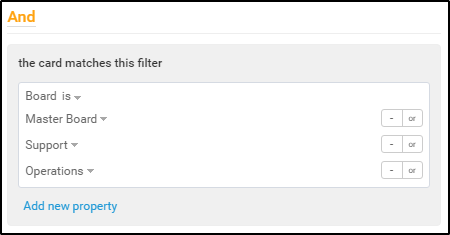 In this case, they will be able to edit/disable/enable the rule. 1. 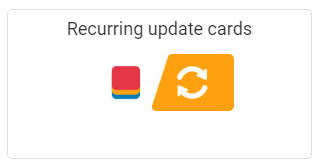 WHEN - here you define a schedule for the automatic card update. 1) Execute At: Click on the time and select an hour between 00:00 and 23:00. The time zone set for your account is displayed. Note: It is important for the execution of the rule to set up your correct time zone in My Account. Practical tip: When the scheduled time comes, the Board is "X" and the Title is "XY" -> set an Assignee. Define the Assignee during the configuration process. Practical tip: When the scheduled time comes, the Board is "X" and the Priority is "High" -> move the card to the column "Expedite". 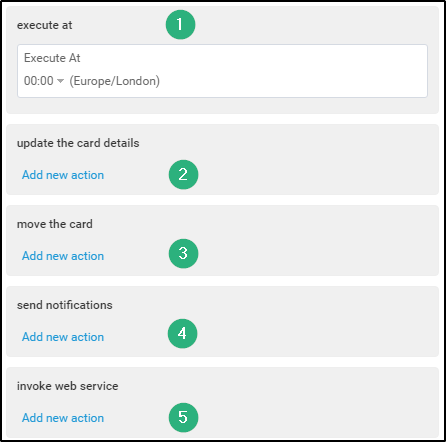 4) Send notifications: The system will notify a user of your choice when a card is updated. Create a template for the notification, which is to be sent and click on Save Message. 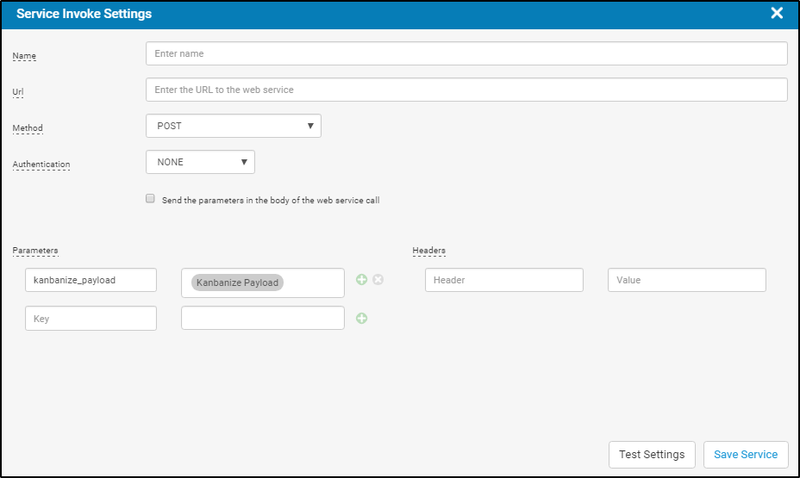 In the To:/Cc: field -> use the "add internal users" dropdown which opens a list of all users in your account including: Self, Assignee, Watchers, Contributors, Reporter. Select and add the user/s you wish to be notified. 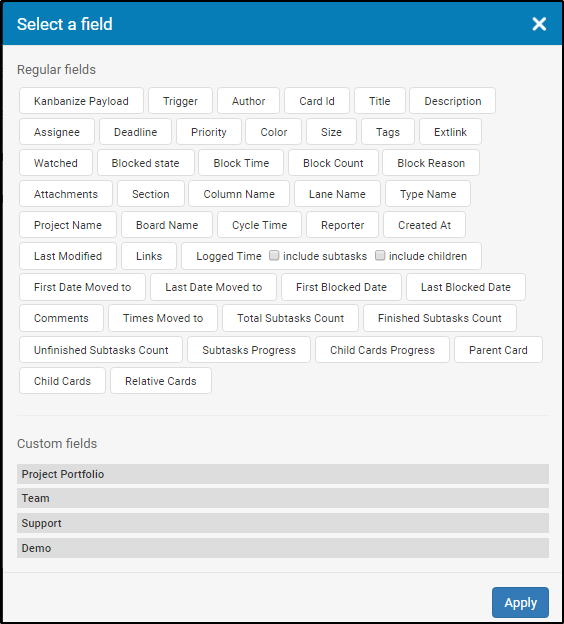 The "add custom field" option is used in the following case: if you have a custom field with an email address and the created card contains this custom field, the notification will be sent to this email address. The subject of the notification email contains by default the title of the executed rule for the card, the column name, board name and card ID. You can modify the title by clicking on "add card fields" and choosing your preferred field/s or you can remove all fields and select a custom title. 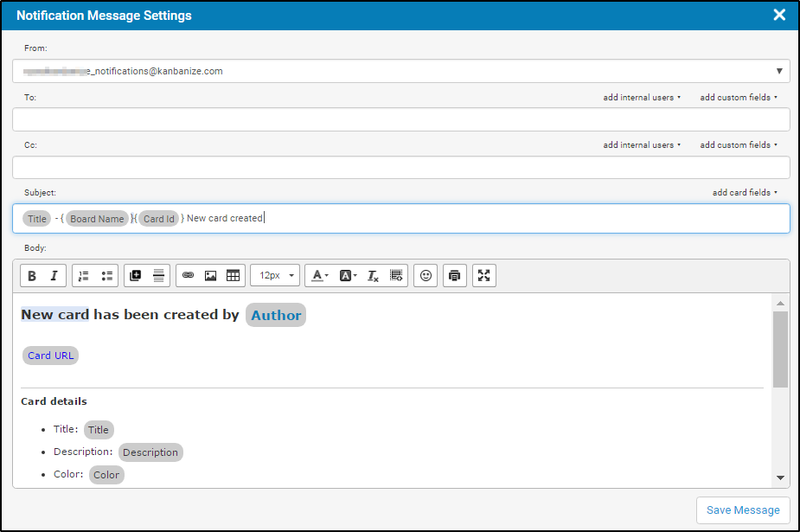 Email body: you can either keep the predefined text or modify it by deleting and creating a new text.